as a prebuild black-box Windows solution (Read: "Get Rich Quick!"). 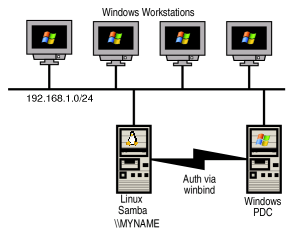 The Linux box has XFS and Samba configured to present ACL's to the Windows clients. reason enough to implement this. work drive every 30 minutes and present those snapshots on another share with read only access. This method of snapshot isn't the most efficient method of micro-backup as the altered block gets copied to multiple snapshots. Some sort of circular buffer in the LVM with a timestamp would mean that we could view the disk at nominated point in time, up to the size of the buffer. I'm not too sure what XFS would think of this as I quiesce the disks before snapshotting at the moment. Anyway, all this is the stuff is potential tomorrow-ware. Note: A snapshot as used by LVM under Linux is an frozen, point in time instantaneous capture of a filesystem. As a block is altered on the "real" filesystem, before that block is written over, it is copied off to the LVM snapshot layer (Copy On Write or COW). If you've used UML (UserMode Linux) you'll know what I mean. This COW has at cost though. than this should be on tape. > Do I need to create a Group called MYDOMAIN, for instance RAVIGROUP? If you don't do this, the users won't have permission to get into the share. When I found your Howto about "Linux, Samba, XFS, ACL and Windows Authentication", I was extremly interested in LVM snapshots. So I tested it but some of the bugs you listed was very annoying. I've worked on your script a little more in order to find some workaround. 2. Is smbd accessing on a file in write mode ? if yes => Unfreeze smbd ; sleep the script ; goto 1. I've had lot of problems with XFS and LVM2 on 2.6(.8, .9, .10) kernels... (ie : xfs_freeze hangs ...) so I choosed ext3. Result: The document has 'readonly'(4xx) user rights, the document is write protected. This behaviour is caused by the special MSOffice handling of generating new files during the save procedure. Do you know about this? Any experiences? Any suggestions? that unix permissions don't matter except when they get in the way. Snapshots disappear when full (could cron/watch/grow em [inefficient]). Inefficient replication of altered blocks across multiple snapshots. Not all properties are supported, just the basic ones. Can we umount/remount if a Samba user is in the share? "busy"? Describe growing a share via LVM/XFS. Windows screen capture of file properties. Mon Oct 20 16:01:25 NZDT 2003 c.mills Try explain why an LVM snapshot is better than rsync.